NOTE: The links in this list are not sponsored nor do they represent an endorsement of any kind. They are just additional resources for you the reader to learn more about the wonders of Albuquerque. Party: They don’t call this town Albucrazy for nothing, and downtown is the epicenter of all the insanity. But don’t get me wrong, there are some chill places to let loose in the hub of the Duke City, and Burt’s Tiki Lounge is one of them. Burt’s offers live music and a laid-back atmosphere everyone can enjoy. Down the street is Anodyne, which provides pool tables, good music, and a diverse crowd for the eclectic party goer. Beyond that, check out the pubs & shopping centers in Rio Rancho, Uptown, along Montgomery Blvd., and the different dive bars & casinos such as Sandia, Isleta, and The Downs, among other party & entertainment spots. Hike: This is one of my favorite things to do - from the foothills, to the volcanoes, to the bosque - there are plenty of hiking trails for both locals and tourists to enjoy. The end of Indian School is one of my favorite places, but there’s something for everyone depending on your interests. Shop: Of course there are Smith’s & Walmart’s here, but the local shops are pretty awesome too! Check out Old Town for some cool Native American crafts, plus all the beef jerky shops around the city. Also, look out for different parts across the South Valley, the Valle Norte, and other places for real Nuevo Mexico style green chile, craft brew, and hand-made pottery. Meander: From the museums to the diversified streets of Burque, there is plenty to look at that you won’t see in other parts of the world. Albuquerque offers a unique mix of arts, culture, creative music, murals, and other beautiful sights & sounds not available anywhere else. Skate, Roller Blade, Bike, and Swim: Skate parks, bicycle boulevards, roller skate rinks, and city swimming pools, like the West Mesa Aquatic Center, are extremely popular. My favorite skate park is on Lomas and Wyoming, but there are many more for kids, adults, and everyone else in between. But remember, we don’t skate or play in the ditches because it’s dangerous, plus you might get killed or haunted by La Llorona. Study: UNM is one of the best universities out there for advancing your education and career. The campus provides a perfect place to learn and transform. It may not be the only place to study around town, but if you’re not a Lobo fan you might want to become one, because over here, everybody’s a Lobo - Woof! Woof! Woof! Succeed: People from Albuquerque make it to the top levels of their industry in every area you can imagine. (Think film, music, arts, & science). Love: Despite being known as the Wild Wild West, this city is full of love. Sure, you might get mad dogged or treated differently for being from out of state, but that happens everywhere. In Burque there is a love for this place that can’t be experienced anywhere else. (Plus, people here are gorgeous, which might make you fall in love in a totally different kind of way). Raise a Family: Ok, so we don’t have the best reputation for that, but I turned out fine. . . maybe. Either way, I think it’s still worth it. I have three children of my own and they’re doing great. I wouldn’t want to raise them anywhere else. Buy a Home: I don’t mean to sound cheesy, but I can help you feel at home in the ABQ, but if there’s somewhere else you’d rather be, I can help you sell your home too. Scott Albright is a Realtor® with The M Real Estate Group. 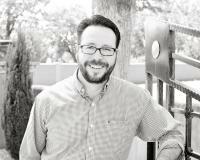 He has actively held a New Mexico associate broker license since 2016. He has a master’s degree in China-U.S. Relations, and a bachelor’s degree in political science with a minor in journalism. Scott can be reached on his cell at (505) 918-2370 or through the office phone at (505) 247-1002 ext. 156.